I bought this mattress for my 11 year old son. 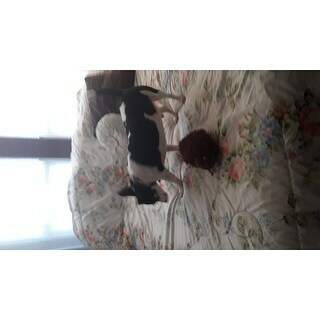 He absolutely lived this mattress. He says it's the best ever. I laid in it myself and I too, thought it was comfortable. I would recommend this bed to all of my friends and family. 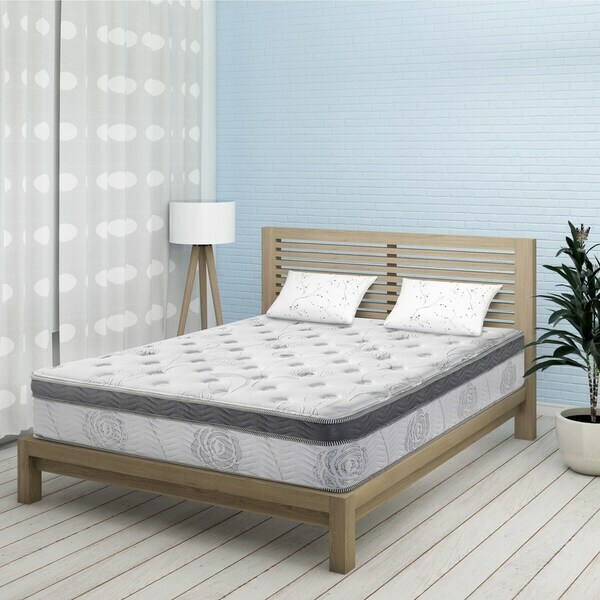 Sleeplanner 12 inch Hybrid Memory Foam Innerspring Mattress is designed to make your spine more comfortable while you are sleeping. Featuring multi layers of foam, you'll get the pressure point relief, temperature regulation, and support you need. Among those layers, the 1 inch of dura memory foam supports and aligns the spine for all-night comfort. Other 2.5 inch of dura HD foam layers keep the mattress feel medium-firm while adding structure and support. And the 7.5 inch of dura coil springs offer you a sweet and comfortable sleep from responding to body movement and the contour of the body. With each independent spring coils, the weight on one spring does not affect the surrounding springs and it helps you to sleep undisturbed. We assure you will feel less movement from your partner unlike a traditional innerspring that has interconnecting wires between coils. This is one of the best Memory foam mattresses EVER! It's difficult to believe it arrived in a box that was easily hauled upstairs to the bedroom where it is now. 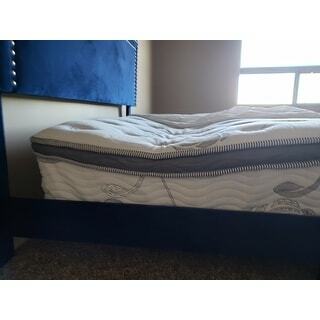 It was super convenient, EXTREMELY comfortable, and works great with the inexpensive box springs Overstock sells! We could not be more pleased with the mattress. Nice comfortable support. Not super firm, like one Memory foam mattress we have- and not super spongy, like the toppers you get- this is really comfortable and appears it will last. I highly recommend! The 12 inch Queen Size Hybrid Memory Foam Innerspring Mattress is comfortable with a nice mixture of soft pillow top over a supportive memory foam base. We ordered this for our 20 year old son, and he is smiling ear-to-ear with the good night's sleep he gets since unwrapping his mattress! He is one happy camper and is usually picky about what he has. This has made everyone happy. I highly recommend it! Great value and looks like it will last! I love my new mattress!! I have ABSOLUTELY no regrets with the hybrid memory foam, other than waiting so long to purchase one. It took months to decide which mattress would be best for me. I read review's, browsed store ads, tested the differences of firmness and comfort in showroom floors telling myself "I'll probably go with this one" yet months later I'm still waking up with hip, neck and shoulder pain every single day thanks to my 8 year old mattress. On a whim I ordered the hybird sleeplanner mattress online, I had no idea what I'd do if I didn't like it or couldn't return it. I was fed up with the pains my body woke up with every morning that I decided I'd make a risky purchase...im so glad I did!! I wake up pain free ! The mattress is exactly as described, came to full size in less than 24 hours and odor free! I couldn't be happier with my new mattress! I definately recommend!! Review update: we have had this mattress for two months now and it has fluffed up a bit more than when I first got it. It’s holding up well and there have been no issues...no allergies and no structural problems, these were the two things I would look out for in a new mattress. The mattress is quite thick and very deep pocketed sheets would be my recommendation, I am using 16 inch pocket sheets...the ones with the elastic all the way around (and there are some great ones on OS that are the least expensive I have seen online or elsewhere). Overall, again, I highly recommend this mattress for a medium firmness with luxury pillow top. We have had several guest sleep on this mattress and each one has commented that the mattress is very comfortable and asked where I got it. Previous review: mattress arrived quickly and was even better quality than I expected. A really great buy! I highly recommend this mattress. It is definitely a full 12 inches in height, nice medium firmness but that memory foam pillow top is awesome! I just spent $1600 on a similar mattress in a furniture store the week before I bought this queen mattress for my son’s room. I should have thought to look on overstock for my king size mattress because I would have saved over $1000. I have never been so pleased with a mattress! The hybrid designed is near perfect; it has the right mix of firmness and soft memory foam comfort. Essentially, instead of a pillow top, there's a memory foam top over spring coils. The movement cancellation is awesome...my husband moves around a lot and frequently disturbs me. Not now!! Love this mattress! So, I purchased my first-ever new mattress for my bed. (I bought a twin one from Overstock last tax season for my guest room last year.) I've only ever had hand-me-downs. All 77 pounds arrived on my doorstep yesterday (free shipping and two days earlier than expected after ordering on Monday) and I managed to unwrap, remove the old, used one from bed. I put it on the old box spring. I feel like the princess and the pea just a little bit and I'm glad I didn't spring for the 14-inch one. I might should have gotten the 10-inch for Toby's sake He's hopping up on it but I worry about his legs and back in the long run. I know there are doggy stairs but I don't want him becoming dependent on them until it's absolutely necessary. It says to let air out and expand to its fullest over 48 hours but it slept good last night, especially after all the tugging, pushing and lifting I did. I really may never leave my bed now! This mattress is super soft so even though I bought it for a platform bed in my guest room, it is super low and sins down. I had to order a mattress foundation that has not arrived yet but I will update this review once it arrives. My son has a platform bed and I also ordered a memory foam mattress for his bed and it is not this low but the same amount of inches deep. So I gave it 3 stars because it really doesn't seem like its 12 inches. I like this mattress. It’s soft and provides good support without being tooo soft. I like that it looks like a real expensive mattress but is affordable for me. This items is a great buy! The next time I need to purchase another the only thing I would request different is the inches. I would get a 14 inch instead of a 12”. I purchased the Sleeplanner 12-inch hybrid memory foam mattress and it was delivered to my house almost the next day. I left the mattress in the box for a couple of days because my move-in date was later. The smell of the mattress is very distinct but the mattress itself is extremely comfortable! My wife and I love the mattress and would definitely recommend the mattress to those that are shopping for a mattress right now. I barely feel my wife moving when she sleeps. I love it! I love, love, love this mattress, I read the reviews but was still skeptical about ordering a matress in a box but I actually look forward to going to bed now, and when I wake up through the night I now find that I can go back to sleep and my back doesn't bother me like it used to. so don't hesitate like I did and enjoy sleep again. Read all the five star reviews. Felt confident purchasing online. This mattress ***. It’s like a noodle. Not firm at all. Once you open this to find out it’s too late. No return. You are stuck with a *** purchase. NEVER BUY A MATTRESS ONLINE. Convenient and excellent price, however, not returnable upon opening and it is much too firm for my preference. Okay so really feels comfortable ordering a mattress without testing it? I mean that's the luxury of going to a furniture store. You have the ability to test it out. With that being said, mattresses are expensive so I wanted to save money and decided to order online and I'm so glad I decided on this mattress. It's so comfortable I never want to get out of bed. Worst nightmare about ordering a mattress online come true - this thing is a lumpy mess and doesn't hold any form at all. I unboxed it according to the instructions and it only expanded to 10 inches, not 12. After sleeping on it for two days, I have a nice little valley where my upper back was and wherever you apply weight it sinks like a bean bag. Total lemon. Never bought a mattress online and was very hesitant but this has worked out well for us. Came rolled up in a box even though it has inner coils. Followed the instructions and left it unfolded, flat for 72 hours. No issues at this point. We even got a KING size. It is very comfortable! Set up was a breeze and the quality and comfort are amazing! Probably the BEST mattress we ordered for the money. We got it for our sons room and I’m slightly jealous now because his bed is more comfortable than ours. Perfect balance between flush and firm. Very comfortable and pleased with my purchase. Helps my back tremendously and sleeps like a dream. This is the best sleeping mattress on the planet. I bought this for my son, I had no idea it would be this great of quality. Everyone that has seen this mattress ask where did I get it from. It is certainly worth referring to my family and friends. Actually, I am a bit jealous it's better than what I have on my bed. "Does this mattress get hot during the night?" I gave it to my father in law who really likes it. All mattresses with foam get hot to me so I am not going to be able to give you an accurate answer, I apologize. "Is this mattress good for a person about 300 lbs?" I would say definitely. I weigh 240 f my wife weighs over 200 and it is excellent and comfortable for both of us. Good firm support, minimal transfer of motion during turning over. "How is this mattress shipped "
It comes in a Large Box delivered by UPS. Inside the box is a cylindrical, nylon bag with a draw-string closure. Inside that bag is a plastic vacuum sealed bag with the mattress rolled up inside it. "How would this mattress hold up with a persons weight of 250ish?" So far the mattress is holding up great. It is a very comfortable mattress and both of us are heavy. "How firm is this mattress is it more medium or actually firm"
I would not consider this mattress to be super-firm. It is certainly supportive, but, especially with the Euro-style pillow top, it's very comfortable and not at all what I'd call a hard mattress. Based on customer feedback, it is more medium firm. "What is the weight of this mattress in a queen size?" I purchased the queen-size mattress myself, and although I can't recall the exact shipping weight, I think it was more than 110 lbs. "I want to buy this right now but need to make sure it will fit on the bed frame I just ordered. Also, is there a recommended box spring to go with it? 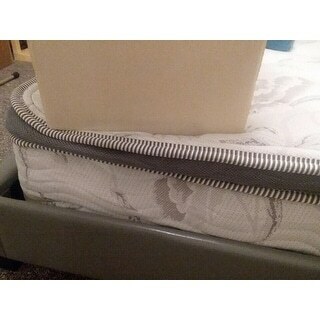 Here is a link to the bed: https://www.overstock.com/myaccount/#/orders"
The mattress is a standard full size. As long as the bed frame and boxspring dimensions are 74 x 54 inches, there should be no issues.